Van Gogh was born in the Netherlands and was the son of a Dutch Protestant minister. He was raised believing that he would follow his father’s footsteps and serve humanity with a religious calling. Vincent put his entire being into becoming the theologian that his father was, but was unable to achieve this goal. He had a tendency to be very single minded with everything he attempted and was prone to burn out followed by failure. Vincent van Gogh was a truly tormented man who saw himself as a failure in all that was important to him, both in his career and his personal life. Van Gogh lived a life fraught with mental illness. He suffered from depression most of his life and his art was his outlet. All of the emotion that he didn’t have a place for came out in his paintings and sketches. During his deepest depressions, van Gogh would sometimes produce a complete work of art a day. Over the course of his ten year artistic career he produced over 2000 works. He only sold one. Not only did van Gogh suffer from depression but he also experienced epileptic seizures, delusions and psychotic episodes. Van Gogh lived, for a period of time, with another artist, Paul Gauguin. 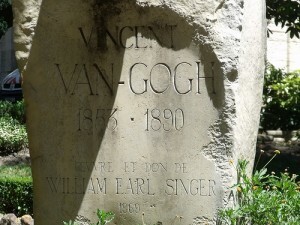 During a psychotic episode, van Gogh pulled a knife on his roommate and attempted to harm him. Later that night, he returned home and in the middle of his madness cut off a part of his ear. No one is certain why this tormented genius chose this particular punishment. But he wrapped the ear and presented it to a working girl, in a neighborhood brothel, and told her to guard it. The demise of van Gogh’s relationship with Gauguin was another of his personal failures, or so it appeared. In 1888, Vincent could no longer deal with his torment. He committed himself to an asylum. He painted while he was there but if he worked for long periods he would experience a setback. It was during this dark and painful time that Vincent van Gogh created The Starry Night, my personal favorite and probably his most well-known work. It is speculated that the swirling patterns in the sky were depictions of his mental state. In 1890, when he just couldn’t take his own misery any longer, Vincent van Gogh attempted to end his sad story by shooting himself in the chest. He lived for two days after his botched suicide effort. It is hard to imagine the darkness of the world that van Gogh lived in. His own personal hell that produced such beauty in the world. How brutally sad that he did not live to see how revered his work would become. This tortured soul was quoted as saying: “I put my heart and soul into my work and lost my mind in the process”. Because I love the works this man created it makes me sad to realize that his genius couldn’t overcome his illness.